Buying electronic books for the Kindle, and in conjunction the Kindle app on various devices – PC, Macintosh, iPhone, iPad, Android tablet, etc. – has just become much more useful for me. Among the nice features of the Kindle software is the ability to hilight blocks of text and to take notes. This is hardly something new; I often hilight passages in paper books too, and use Post-It notes to leave my comments, questions and thoughts. The hard part is in remembering exactly which books on my shelf held the quotes I marked or notes I left. With electronic books and notes, I should be able to let the computer do the remembering and searching for me. Unfortunately the Kindle is pretty much a closed system; I’d found no easy way to get to the highlights or notes other than through the Kindle itself. That makes the use of hilighted text in blog posts, letters or presentations difficult. All that changed today, thanks to this article and a comment left by someone named Zach. I’m happy to have found a way to get information out of Amazon’s system. It’s by no means perfect or automatable, and there’s no guarantee that Amazon won’t change this or take it away at some point in the future, but for now it’s better than nothing. Go to kindle.amazon.com, log in using your Amazon account, and click on Your Books. 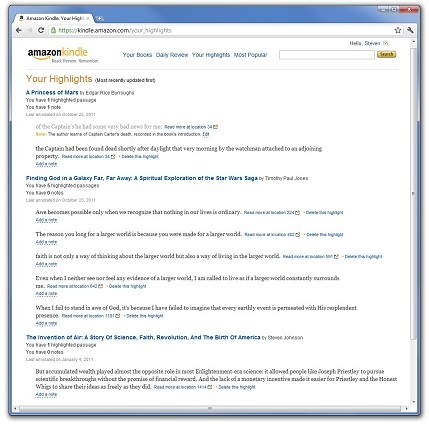 You should get a listing of Kindle books you’ve purchased from Amazon. See updated info. If you’d like to use their system to keep track of your reading, you can do so under the Reading Status column, and you can rate your books as well. You also have the option here of making your status, ratings and notes public from this page, though I’ve not figured out yet how someone else would see them. update: use the “Hello <name>” menu at the top right-hand corner of the page to view your Profile, then people can use a link like this (thanks to this post by Scott H for helping me discover it). Now for the good part – click on Your Highlights at the top of the page and you should see a listing of books along with your notes and hilights. See updated info. From here you can copy the text and paste it wherever you’d like. This changes the decision of what format to purchase books – electronic or paper – for me. This is not meant to be a method for wholesale plagiarism, of course. Interesting juxtaposition: my initial search for “how to copy text from hilights” came as I was trying to decide what format of a book to buy, paper or Kindle. The book in question is The Innovator’s Cookbook, by one of my favorite non-fiction authors, Steven B Johnson. The article I reference above, where I found the comment, is in response to something Steven wrote. And today, at about the same time as I was creating this very post, Steven was posting to his own blog about a tool to “capture what I was reading.” The tool is Findings, and it includes a way to grab data from the very kindle.amazon.com page I had just discovered! This isn’t the first time that this has happened, by the way, see Accidents and Emergence.